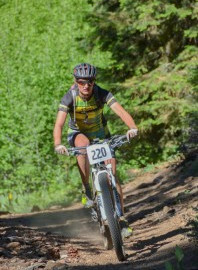 Xterra was a second priority focus for me this year, with my season primarily organised around performing well at Leadville. 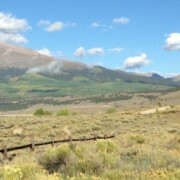 The mountain biking season seems to finish really early when it still feels like mid-summer so I had planned after Leadville to jump into the end of the Xterra season and trust that my bike fitness would carry me through. The plan seemed to be working well, when just a week after Leadville I pulled out the overall win at Xterra Lake Tahoe – the course I raced my first ever Xterra on in 2009. With 5 weeks to the Xterra US champs in Utah, some quality run workouts, bike intensity, and enough swimming to be in the ‘respectable’ category I hit the week before nationals with a reserved confidence. I was a little on the tired side, so the week leading into the race I took pretty easy, with just enough movement, a killer massage (Zenergy in Truckee – highly recommended), plenty of sleep and good nutrition. I flew into Salt Lake City late on the Thursday before the race – delays meant a post-midnight arrival which was non ideal, but I had all day Friday to ride a little, sort my race stuff out and still get a good afternoon nap in! My bike had been driven across Nevada to Utah by Debby which lowered pre-race stress levels immensely, and while I didn’t have Dennis with me (the huge King Fire was causing uncertainty too close to home so we had to make a last minute, possibly over-reactory decision to have him stay at home) to help out and support me, I had done this race enough times and knew the logistics almost in my sleep, that I was pretty calm (not that I’m ever that anxious before a race!). After resting up for more of the previous week than I was predicting, I needed a decent enough ride on the day before the race to make sure my legs were ready. Debby and I chose to ride the top loop of the course, just enough, but not too much. The course was in great shape with fall colours, fallen leaves, and tacky trails. My legs definitely needed the hours ride and by the end I was hopeful I would be in good shape for race day. We stopped at pineview reservoir on the way back to Ogden for Debby to swim and me to go for a little run to test two different pairs of running shoes as I was still undecided on the best pair of On’s to tackle the hilly and rocky run course (I was glad I went with the tougher Cloudrunners vs. superlight Clouds). The 20mins or so I ran gave me another confidence boost that things could go well the next day. I knew my swimming wasn’t in great shape, but I had swum enough to know that I could swim steady and relaxed and plan to not expend too much energy before hitting the bike section. Race morning was warmer than previous years; set up and warm up went smoothly and before I knew it I was in the water headed for the first buoy. I had decided to take the inside line this year – I’ve always lined up to the outside and it’s never worked well, so this time I tried something different, mainly as it looked like the shortest route possible to the first buoy and I didn’t need to be swimming any extra yards than I had to! I took straight lines, stayed out of the madness of what looked like most people swimming far wider than they needed too – while this gave me the shortest distance, with no-one around me I had no drafting opportunities. This was the most comfortable swim I’ve ever had at nationals; by no means fast, (but actually 33min for the measured 1.1miles – long as usual at the race!- was about the best I could have hoped for) but I stayed relaxed and wasn’t tired or flustered once I got out the water. I really had no idea on my position at this point, but I had a good transition and mounted my bike using the new skills I’d learned from a cyclocross clinic I’d been to the week before making for a fast exit and start to the bike. I knew I could go hard for the whole bike and only slightly risk over-cooking it before the run, but I knew where my strengths were this year and if I wanted to do well I had to push the bike almost to my limit, while still riding smart, efficient and taking good lines. I got into a zone on the bike I had only properly found this season – I wasn’t concerned about people around me and found a way to pass when I needed to as quickly as possible without being held up. I recognised a couple of faces of faster swimmers than me who I passed within the first 10minutes of the bike – this was the first sign I was riding well, then when, just 30 minutes or so into the bike, I passed the back of the female Pro field who had started 2 minutes ahead of the age groupers, I got another signal that things on this course might finally be going my way. I was pedaling smoothly and constantly passing people with relative ease and possibly still an extra half gear I could have used. Don’t get me wrong, I was working as hard as I thought was sensible, but instead of getting tired and feeling the burn in my legs of the constant climbing, I felt smooth and powerful. At the bottom of the Sardine Peak climb – the last 3 miles or so of climbing, I passed my third Pro female, something that had never happened before in an Xterra; even if they were having bad days, I was certainly on track for a good one at this point. I also passed a girl in my age group who I had thought might be my toughest competition on the day, and rode away from her, still with several miles to go of the bike course. Knowing there were far faster runners than me that I was passing on the bike, I knew I had to put as much time as I could into them before the end of the bike leg. Cresting the top of Sardine Peak, I had ridden on my own for a few minutes before I came up on a female in the age group above me, she got away from me a bit on the downhill but before the end of the bike I put in a push to get past her so I could start the run in front. By this point I thought I was probably fairly far up the age group race, but I really had no idea if there were more of my own age groupers ahead of me or not. I’d done what I could on the bike, and from my computer I could see I’d pretty much hit my 1hr45min target time which I knew would put me in a great position, and better still it was close on 15 minutes faster than last year on this course, and 10 minutes faster than in 2012. Using my new found cyclocross dismount skills, my entry into T2 was smooth and fast, as was my exit onto the monster climb at the start of the run straight up the side of the ski run in front of us. There is no way you can feel that good with a run that starts as brutally as this one, but anything that looks even vaguely like you are running vs. walking is good in my mind! I set off and could run vs.walk or shuffle, so I settled my breathing and got my mind focused onto this first climb of the run; I knew where the top was and that there was some nice flowing (but rocky!) singletrack to get the legs going just after the top. A small power hike up 20yrds of the steepest grade and a mental forcing to start running again after it got me over the top and I opened up my stride onto the singletrack to start pushing through the miles. I had a couple of guys just in front of me who kept me at a pace just a tiny bit faster than maybe I would have run on my own which really helped – the run course can be lonely as the miles seem long and it’s quite a long way to the first aid station, so I was glad of the company too. One of the guys stopped for a break on a short uphill; I encouraged him as I passed to keep it going – it was all mental at this point when things were starting to hurt, and I’d worked hard on my mental game this year so was feeling strong and still confident I could keep pushing. There was still plenty of climbing ahead on the run, but as each aid station came and went with a couple of cups of water at each I was making good progress. It’s not until well after mile 4, that you can really smell the downhill and start picturing the finish. There were no girls in sight, until on the fast downhill switchbacks in the last mile I spied Meghan Sheridan, a frequent front of the age group race finisher – I’d never been within sight of her on a race course before; I was already running as hard as I could downhill and she was just out of reach before the finish. As I crossed the line, they announced I was 3rd overall amateur – a quick bit of guesswork on my part figured I had also won my age group; I was pretty sure Hannah Rae Finchamp would have crushed the age group race to get the win, I’d seen Meghan just in front of me who was in a different age group, then it was me, a National Champion! 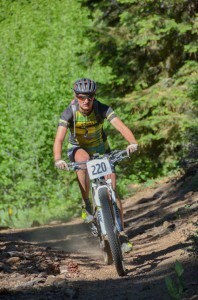 This race was about swimming smart, using my confidence in my biking strength, then sourcing mental strength for the run, hoping the endurance I had built for leadville would translate to the tough run after pushing hard on the bike. The plan worked. I had known I could race well on this course but in previous years had left disappointed. I can’t thank Julie at O2 fitness enough for giving me the fitness and tools to perform this well on a hard course at the right time, and the Braveheart Team for giving me a reason to race beyond just for myself. 5 Braveheart Elite team athletes raced at the US national championships and we took 3rd in both the mens and womens Pro races, as well as 3rd in both the men’s and women’s amateur races (both becoming national champions) and another 3rd place age group podium. Yes, all of us on the team work hard and are successful athletes in our own right, but being a team in an individual sport is something special which I hadn’t realised until recently. Next up; Xterra Worlds in Maui in 5 weeks. It’s a long season, but I’m still itching to train and race, again a testament to Julie’s varied training program, pitting just the right amount of physical and mental rest and recovery against quality, focused sessions.